I’ve been asked to do a review on a new programming book published by Packt Publishing and written by Michael Badger. Normally I’d probably have multiple heart attacks over anything to do with programming, but this book teaches people how to use Scratch. Some of you older readers might remember me blogging about this a couple of times (in fact, my very first post writes about it). I’ve been using Scratch for a few years, and even though I don’t actively play around with it now, I’d recommend it to anyone who is interested in learning how to program. Anyway, on to the review. This book covers everything from installation to using things such as a PicoBoard to bring the real world into Scratch. Quite literally. It walks you through all the different features of Scratch at an appropriate pace. I liked the fact that it didn’t go into so much depth that you were lost in tech-speak land, but it explained it enough so that you understood how the commands worked. It covers all the major commands and treats them each as a separate ‘experiment’. It would be a good idea to have Scratch open while reading, so you can simply switch windows (or if you get the actual book version, just look at the screen) and try it out for yourself. The book also explains the basic concept of how Scratch is layed out (sprites, the background, blocks, etc.) which I feel would be useful to a beginner. Sometimes screenshots of blocks are used instead of words to explain things (mostly examples). These are useful if you get stuck, but I like to try to figure out how to do it myself first. After a while, you’ll move on to entire projects. These get harder and harder, and I found myself discovering new ways to use blocks that I had never thought of before. I also found some useful notes about new blocks that I had no experience with, as I had a very old version of Scratch and hadn’t updated it in a while. My favourite addition is probably the list feature. It opens up a ton of new project ideas that usually would have needed complicated variables and a lot of fine tuning to get right. This book is very content-rich, and would be a great help to learn how to program, whether you’re an educator or simply someone wanting to know a bit of programming. Younger readers probably wouldn’t be interested though, as it seems to be aimed at a higher age. (But that doesn’t make it any harder to learn!) One problem I had with it is the eBook format. I found it very hard to read from, as I constantly had to scroll down to the next “page”. Books are books. You can’t turn them into downloadable webpages – it just doesn’t work. However, this is just Adobe Reader’s bad layout. But I’d recommend getting a real book anyway, even if it is more hassle having to order it. Overall, this is a good book to learn from, and it doesn’t have that “school book” feel that most educational books do. The author doesn’t strive to make every sentence contain at least one 15-letter word, and the language seems very laid back. Click here to be brought to the Packt Publishing website if you’re interested. Don’t forget to read my Poptropica post and Jamie’s maths post if you haven’t already. Sadly, we didn’t make 100,000 hits. We were close though, 94,400! To cheer me up I have added snow flakes to the blog! Now, where ever you are on my blog, you’ll see falling snow flakes! It will probably only be around until Jan 2nd, because WordPress is taking this feature away then & will bring it back next year. As a promised, this is the list of people who tried to help me get 100,000 hits (in no particular order). Click their name to go to their site. I also got a Scratch Board! It lets me bring the real world into Scratch! You can read more about the Scratch Board by downloading this. There’s also a new puzzle. That’s all the news for now, bye! The original Project was called Mick. Scratch 1.2 is out of beta & is available to download here. You can see the new features in the release notes. Also, I’ve got a new hint for what might be coming to ‘Legoless’s Fun Pack’. Billybob posted a new sneak peek! I’ve updated my Club Penguin Halloween Sneak Peek Tour project a lot. Click the picture below to see it! 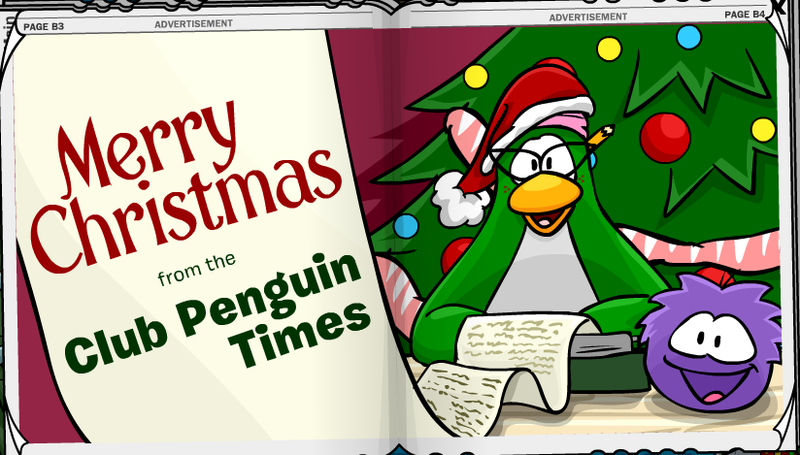 Reminder: The party hat in the Book Room will be there for today only. Tomorrow it will be gone forever. Get it! It might be the Plaza again, or maybe a new one. Be sure to look at my Halloween Party Sneak Peek Tour when it comes out, because I will update it! But right now the Scratch website is down. I made a Scratch project that lets you explore the Halloween Party before it starts! Well, all you can do is look at the three sneak peeks. (Cave, Plaza, Forest) It was just a very simple project I made in my spare time. If you wanna see it, click the picture below. It also has music from last year’s Halloween party!